Deneen Reynolds-Knott is a playwright living in Brooklyn, New York. 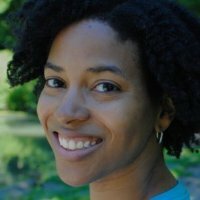 She has developed work with Rising Circle’s INKtank Development Lab, The Frank Silvera Workshop’s 3in3 Playwright Residency, The Dennis & Victoria Ross Foundation, Little Black Dress INK and Primary Stages/ESPA. Her full-length play, BATON, was selected for the 2018 Premiere Play Festival and received a workshop reading at Premiere Stages, the 2017 Playfest at the Orlando Shakespeare Company and was a finalist for the 2017 PlayPenn and Bay Area Playwrights conferences. For the 2018-2019 program season, she is participating in the Writing Residency at Liberation Theatre Company and Project Y’s Playwrights Group. Deneen is the co-creator and executive producer of BULK, a web series about friendships and romances within the gay bear community in New York City. She received her MFA in film from Columbia University.